A member of the 1965 Pekin Lettes softball team enshrined in the Hall of Fame, Kerwin holds 13 single-season and career records for the Lettes. 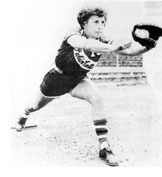 The infielder competed in 12 national tournaments (49 games) and played five seasons as a professional - starting in 1949 with the Peoria Redwings - to finance her education at Illinois State University. Kerwin has won 75 Senior Olympics gold medals in 20 sports - with at least one gold in every sport. An elementary physical education teacher for 30 years, she coached two unbeaten teams at Oak Grove School in Bartonville. Kerwin played a total of 31 softball seasons, spending time at every position except pitcher. Her career started at age 14 with Farrow Chix. She was player-coach for the Peoria Pekin Independents, twice Illinois AAU basketball champions, and played in three national AAU tournaments. She also starred in basketball for four seasons at Academy of Our Lady High School, then was high scorer for the Caterpillar Dieselettes from 1942-47. She led Illinois State University in scoring four years and also played collegiate volleyball, softball and field hockey. Kerwin is a member of the ISU and the ASA Illinois Halls of Fame.